In 1975, I typed in all known nucleic acid sequences (most of which were tRNAs) and then folded them into structures based on the first tRNA 3D structure that we were refining. It was such an amazing experience that I started hoping that every person could afford to see their own DNA sequence. 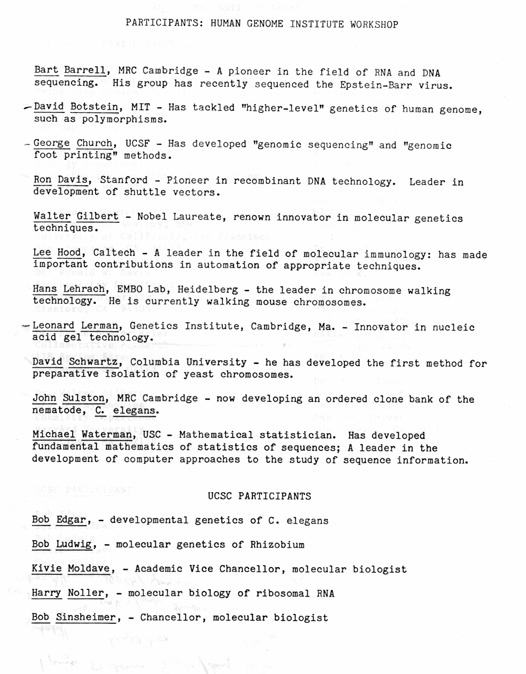 I was further stimulated by RNA sequencing by Jack Nichols at Duke, I began dreaming of (affordable) genome sequencing when Wally Gilbert gave a seminar at in our department in 1976 on a new DNA sequencing idea (published in 1977). I joined Wally's lab in 1977, writing automated sequence reading software in 1978, and then in 1980, got serious about mammalian genome-scale issues in research leading up to our 1984 "Genomic sequencing" paper. The HGP "began" at three meetings in 1984-5: Alta UT, Santa Cruz CA, and Santa Fe, NM. I was the only person present at all three meetings. Delehanty J, White RL, Mendelsohn ML. Mutat Res 1986 May;167(3):215-32. Approaches to determining mutation rates in human DNA. In 1986 DOE launched its "Human Genome Initiative". The "OHER Research in Progress: FY 1988" lists three sequencing technology "offsite contractors": Richardson (Harvard), Church (Harvard), and Gesteland/White (U. Utah). The NIH and other agencies became involved about a year later. I helped establish three of the first NIH HGP centers in 1990: Whitehead, GTC & Stanford Sequencing Centers). These teams contributed to the first human genome sequence. The GTC team produced the the first genome sequence sold commercially (1994) and (as part of Agencourt) at the time the largest commercial DNA sequencing group and the only commercial NIH genome sequencing Center in the HGP. From the very beginning of the HGP, I was lobbying for improved sequencing technology and against excessive costs of focusing on mapping, on racing with companies, and on cataloging common SNPs. The internet has played a huge role in the HGP. For example, see: "assemblies of greater than 1 Kb would be released automatically on a daily basis." , NCBI , Distributed Annotation System (DAS), and our experience. Is the human genome finished? See Sanger Inst FAQ & NHGRI-FAQ. The (Oct 2004) version had 341 gaps including 1% of the "gene-containing portion" of the genome and 7% of the genome so far described as "the rest". It is an imaginary "haploid" mixture of alleles, rather than a true diploid and furthermore the phenotype of the individual(s), e.g. RPCI11 is unknown. This lack of phenotype is also true of the HapMap and 1000 genomes project. The 2018 (haploid) version. PersonalGenomes.org (established 2005) addresses these issues and is an emerging international standard for DNA and cells. Our group has also pursued "genomic sequence comparisons" (the title of my 1987-2003 DOE grant) and "functional genomics - systems biology" approaches to determine the meaning encoded in the many (complete and incomplete) genome sequences that we now have, and to engineer useful new "omics" -based technologies. We have also been championing a Personal Genomes Project (PGP) and the technologies to make it affordable ($1K per genome). Our "genomic sequencing" in 1984 lead to "multiplexing" in 1988 then "Polony Sequencing" in 2003, and the uniquely open-architecture Polonator in 2008. Now is a good time to find ways to help volunteers who wish to make their genomes and phenomes publicly accessible, as well as individuals requesting strong privacy. For additional background see Scientific American book "Understanding the Genome" and article "Genomes for all". 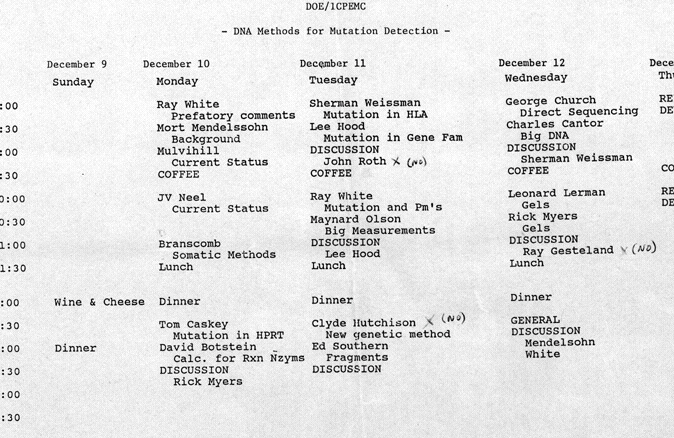 The 1984 Alta meeting: "DNA methods for Mutation Detection" 16 participants: Ray White (U. Utah), Mort Mendelsohn (DOE-LLNL), John Delehanty (Burrough Wellcome), John Mulvihill, James V Neel (U. Michigan), David A. Smith (DOE), Elbert Branscomb (DOE-LLNL), Tom Caskey (Baylor), David Botstein (MIT), Sherman Weissman (Yale), Lee Hood (Caltech), Maynard Olson (Wash U), Ed Southern (U. Edinburg), George Church (Harvard/Biogen), Charles Cantor (Columbia), Leonard Lerman (Genetics Inst. ), Rick Myers (Harvard).